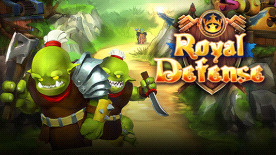 Royal Defense is a Tower Defense game for PC, mobile and other platforms. Follow the exciting story of the dwarven kingdom's eternal struggle against the troll hordes, who want only to crush the dwarves and claim their territory. All your towers and units have specific stats: Damage, Fire rate, Damage radius, Damage type, as well as various other features, such as enemy slowdown and Damage Over Time. Each level also brings new units and structures to help you fight the troll menace. You’ll never be lacking for new and exciting ways of decimating those nasty trolls!